← Photos from the second week of July. 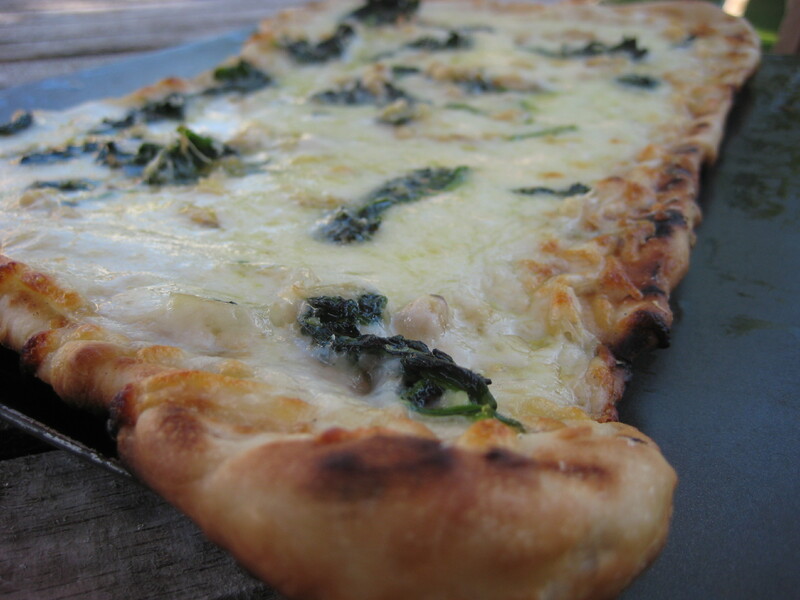 Grilling creates a perfect pizza crust. I like to have a base recipe and a no fail method of cooking just about anything that comes out of my garden. The answer almost always to the question “What should I do with this?” is: grilled pizza. The perfect blank slate for any herb or vegetable, it can take on any flavor profile it needs to. To make this super easy, I make balls of pizza dough in advance at my convenience. They freeze and thaw nicely. And it’s much easier to make a double or triple batch of dough when I’m already doing it anyway then it is to create new dough every time we want to eat pizza. I have found the perfect dough for me, but I do recommend that others experiment because dough can vary based on several things such as which brand/type of flour or yeast is used, climate, how it is mixed, the method used for thawing. Flavor and mouth feel matter too. My perfect dough isn’t necessarily THE perfect dough, but it works best and tastes best for me. 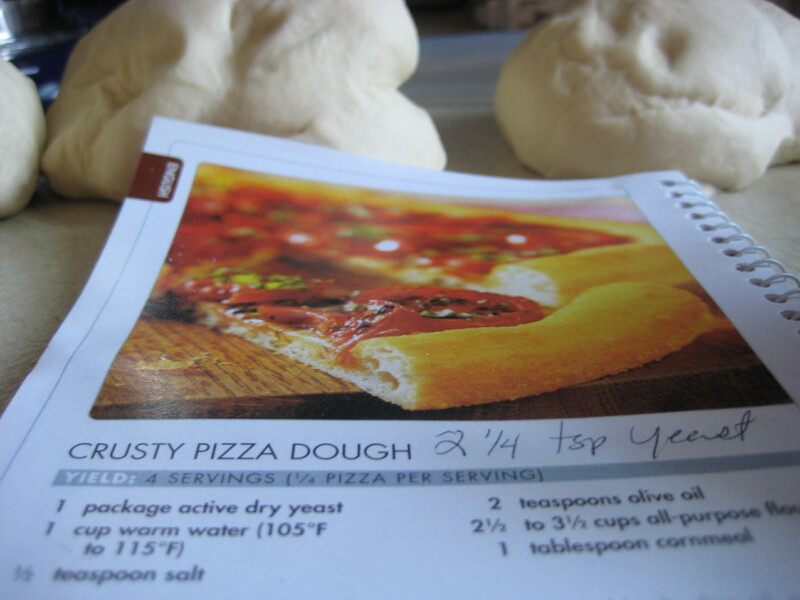 I love this Kitchenaid pizza dough recipe. I have often added garden herbs to my pizza dough to make it a herbed crust. This tastes great as a pizza or made into bread sticks. In addition to having these items ready to go, I make sure to preheat the grill well ahead of time so that I’m sure it’s piping hot when the dough hits the grates. 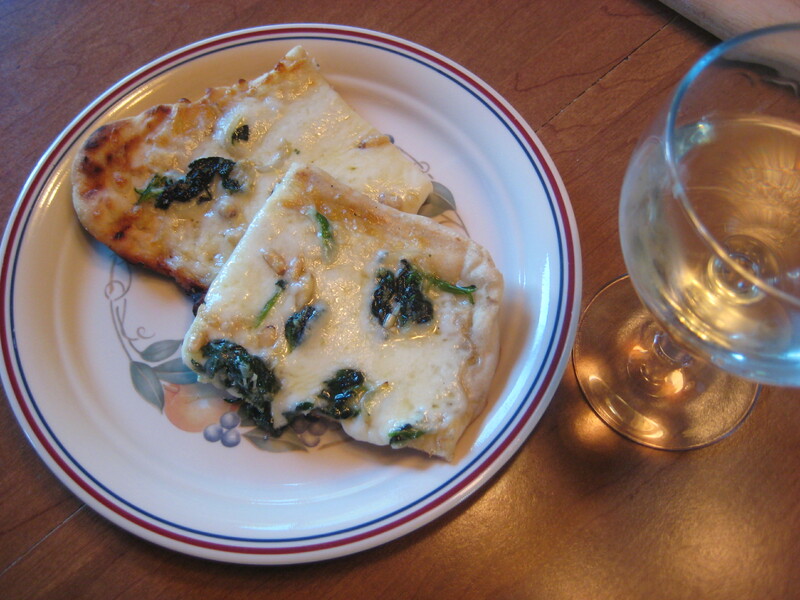 Smaller pizzas are easier to work with on the grill, though it’s certainly possible to do a large one too. I will usually divide the above pizza dough recipe in half and make two pizzas with thinner crusts, or even four personal sized pizzas. The process is pretty straightforward. 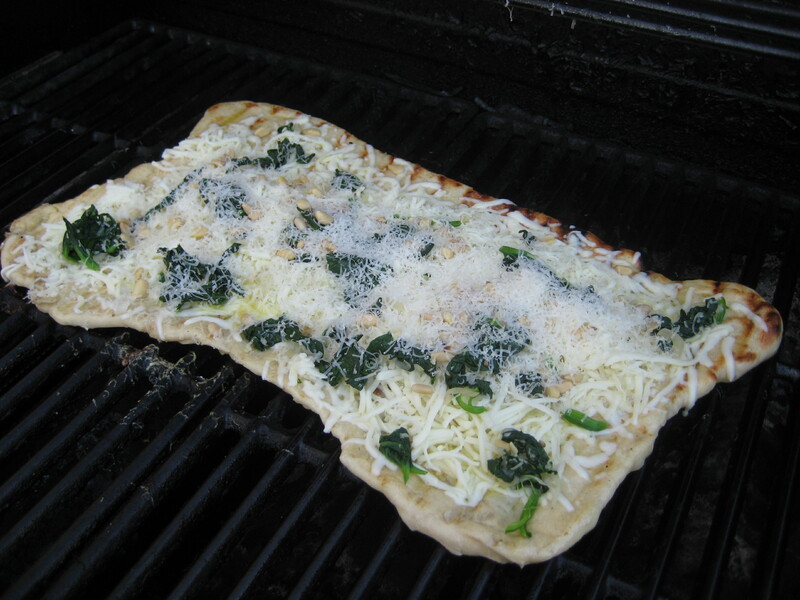 With the grill on as high as possible, I oil the grates and then carefully lay on my prepared pizza dough directly on the grates. If the heat is high enough, the dough will not fall through the grates. While the grill is working its magic I quickly brush on some oil to the top of the dough. It only takes a minute or two on high for the dough to bubble and become stiff enough to turn over. I do this carefully using the spatula and tongs, sometimes employing the cookie sheet if it’s a large pizza. Once it’s flipped over and I have the grilled side up, I turn the heat down to low. Now I can put on the oil or sauce and the rest of my toppings. This part is fun. I enjoy tossing on fresh herbs while it’s on the grill and also when it comes off the grill. Once I have the pizza topped I shut the lid to the grill and let it cook. Topped and ready to finish off with the lid down. It doesn’t take long from this point. Five to ten minutes depending on the thickness of the dough or how many toppings are piled on. It’s possible to eyeball from here. When I like how it looks I slide my cookie sheet underneath the pizza and pull it off the grill. Hot off the grill is a good time to drizzle with extra virgin olive oil or sprinkle with herbs. Handfuls of arugula or baby spinach are nice to pile on at this point too. Whatever is fresh and delicious in the garden will be great on a grilled pizza. I do use a gas grill which allows me to turn the heat down. If cooking on coals you’d need to set up a hot side and a cooler side. There are so many delicious possibilities for grilled pizza. I’m so happy to have this cooking technique in my arsenal, as it’s something I go back to many times during the growing season. This entry was posted in Cooking, Tutorial and tagged grilled pizza, grilling pizza technique, grilling with garden vegetables, pizza. Bookmark the permalink. You’ve shared so many wonderful ideas…..very inspiring! I love the vintage plate! Mmm ~ I’m starving after reading this! and no doubt is a real winner with a glass of wine. ps: Homemade pizza dough? Wow what a treat. Hi Angela! Excitied to share your grilled pizza receipt with friends this Sunday. I think I’ll pair it with key lime cheesecake for dessert =) Your Dad forwarded photos to the office of your two cuties in the garden. Your herb garden is beautiful…I’m sure the aroma is wonderful as well! Enjoy your weekend. Crystal, hope it works out for you. I made four pizzas for dinner tonight and there wasn’t a crumb left! Thanks… enjoy your weekend as well.